Google Translate: the end of language barriers? Instead of lugging around multiple dictionaries or hoping to get around with your very limited knowledge of a foreign language, you can just download one app on your phone: Google Translate. You know exactly what kind of delicious authentic meals you can choose by quickly snapping a photo of your menu. Google Translate has definitely changed the way we travel around the world. Google Translate could be the last piece of the puzzle of globalization. Globalization is the interconnectedness of large parts of the world within systems of political, economic, cultural flows and networks. The barriers of time and distance have been greatly reduced by modern technologies of travel. The last hurdle is language. Google Translate could be the answer. In what way has Google Translate affected globalization? And how can that especially be seen in tourism? Google Translate is a free multilingual machine translator. It can translate texts by using Statistical Machine Translation (SMT). SMT sees translating as a machine learning problem. By applying a learning algorithm to a large body of previously translated text, the translator can translate previously unseen sentences (Lopez, 2008, p.2). When Google Translate was launched in April of 2006 it used United Nations and European Parliament transcripts to learn from. From November of 2016, Neural Machine Translation (NMT) was implemented. NMT uses neural network models to learn a statistical model (Brownlee, 2017). The main difference with SMT is that NMT translates whole sentences at a time instead of translating small pieces. And because of the end-to-end learning system built on NMT, Google Translate will improve over time since it learns to create better, more natural translations (Turovsky, 2016). Google Translate now supports 103 languages. Not all of the functions are supported in all of these, and not all of them use neural machine translation. Some of the functions include real time conversation, image translations, and website translations. The advantages of Google Translate over similar machine translators are that it is free to use, developed by a familiar company, and is easily accessible via the app store on your smartphone; it even may be pre-installed. Can Google Translate become the main resource for translations? Will Google Translate, or other translation devices, be able to replace being fluent in a foreign language? According to Markus Witte, CEO and founder of Babbel, a language learning company, this is not the case. He believes that a vital part of language will be lost: seeing the world from someone else’s point of view. A different opinion is provided by Harrison Jacobs, Business Insider’s international correspondent, who thinks Google Translate is a crucial addition to anyone’s trip abroad. He agrees that nothing can substitute actual fluency, but Google Translate is a good alternative. Andy Martin, writer at the Independent and translator, likens Google Translate to “a particularly uninspired apprentice translator.” He believes that “if you want to be a good translator, don’t translate. Only bad translators translate. You have to live it.” This is in part because Google Translate cannot take context into account or use imagination to translate poetry or literature. But it also leaves out culture and society. There are many words that are typical for a certain culture or country. These concepts can be explained in one word in that language but could need multiple sentences in other languages. The dutch word "gezellig" is translated as 'cozy' by Google Translate. But it means more than that. It is similar to the Danish concept of 'hygge'. 'Hygge' and 'gezellig' stand for concepts that are immediately understood in their cultures of origin but cannot be translated by Google Translate. It also cannot be used as an alternative when it comes to confidential documents since Google has free reign over the information (Schild, 2017). Google Translate is not an accurate alternative when it comes to being fluent, translating literature or confidential documents. Google Translate's goal has always been closely related to globalization. Barak Turovsky (2016), product lead of Google Translate, says: “Our goal was to break language barriers and to make the world more accessible.” This statement clarifies the view that Google Translate is a contribution to globalization. Their goal from the start was to make communication between different parts of the world easier by breaking down language barriers. “Our goal was to break language barriers and to make the world more accessible"
Google portrays Google Translate as a means to a language-barrier-free world. This started by simply translating words or sentences put into Google Translate, but has now expanded to include full website, voice, and image translations. But Google Translate is also a product of globalization. If the first two barriers, time and distance, had not been broken down then this would not have been necessary. Thanks to the inventions of planes and the Internet, time and distance do not matter anymore. You can connect with every part of the world, whenever you want because of the Internet. And if you need to physically be somewhere, you get on a plane and you are there within hours instead of weeks on a boat. Google Translate has an important part in this process since you can translate practically anything with only a few clicks. It’s no longer a problem when you end up on a website in a completely foreign language or if you are confronted with a menu you cannot read. Superdiversity is an extreme level of diversity caused by two major changes after the Cold War: (1) new patterns of migration causing demographic changes, and (2) the emergence of the Internet and its generalized spread, influencing all aspects of social, cultural, political and economic life. These two changes have also affected globalization. Languaging is used to make meaning in day-to-day interactions. There has been a shift from language as a noun to languaging as a verb. “Language” as a noun is seen as pure and grammatically correct. Blommaert says that “the rules of language are what they are, because the rules of society are what they are.” Google Translate influences these concepts in two ways. It positively affects languaging because it can function as another linguistic and communicative resource. On the other hand, it has a negative effect because instead of languaging, Google Translate can also function as the only form of communication and thus strengthen the concept of language as a noun. Instead of trying to express yourself by hand gestures and a mix of your mother tongue and/or the use of English, Google Translate can do all of the work. This is negative especially in the context of travel because a certain spontaneity and sense of adventure gets lost. But in general, Google Translate makes (super)diversity disappear. People stick to their own language and rely on Google Translate for contact with other languages and cultures instead of languaging. According to Castells (1996), the nation becomes transnational, flexible, dynamic, less predictable and “virtual”. His central claim is that globalization shapes new forms of social structure. We now live in a network society. Castells defines a network society as “a society whose social structure is made of networks powered by microelectronics-based information and communication technologies” (Castells, 2004). Instead of having a production economy, we now have an information society and a knowledge economy. Castells notes that the Internet spread out faster because of multiple reasons. The one with the biggest impact was “the rapidly growing social demand for the networking of everything, arising from both the needs of the business world and the public’s desire to build its own communication networks” (Castells, 2010). Google Translate fits perfectly into this society’s new needs because it enables everyone to network with people from different parts of the world. Languaging becomes more complex and it enables networking, which is why Google Translate is a contributor to globalization. Figure 1. Photo of a sign at the Hells of Beppu, Japan. Figure 1. A sign at the Hells of Beppu. Beppu, Japan. In this case there are multiple translations from the Japanese text already present on the sign itself, namely English, Korean and Chinese. But the translation: “A protector give me the small child hand in hand” does not make complete sense. The general message comes across also partly because of the graphic but the translation is not clear. This sign can be found at the Hells of Beppu, a very popular tourist spot in that area. This explains the presence of the English translation. In this case there are two simple ways to translate the sign. Since writing Japanese Kanji is difficult, even more so on a European phone, the image function is very convenient. Figure 2. Screenshot of instant translation in the Google Translate app. Figure 2. 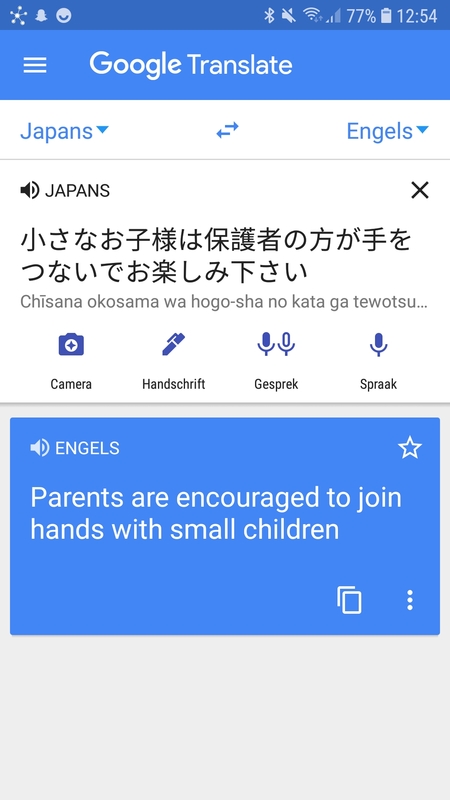 A screenshot of an instant translation from the Google Translate app. Figure 2 shows the translation that Google Translate comes up with when the instant translation function is used. Google Translate will immediately translate what text it can recognize and show the translation on the photo. Usually this is not the easiest or most accurate way to translate. If the camera is moved the translation will immediately change because the program will think you’re trying to translate a different sign. This function will therefore only work if you need to get the general gist of what the sign is saying. The translation that the instant translation came up with is: “small children who are the Guardian enjoy a hand in hand,” which makes even less sense than the translation already on the sign. Figure 3. Screenshot of alternative instant translation in the Google Translate app. Figure 3. A screenshot of an alternative translation from the Google Translate app. Sometimes if there are multiple languages visible in the image it will try to translate those as well. In case of this sign it tried a couple of times to translate the English translation from Japanese to English. It tried to translate the Korean and Chinese as well trying to translate a line drawn in the graphic (see: discharge). This shows that this method is not 100% correct in identifying words. Instant translation should therefore only be used to get the general idea. Figure 4. Screenshot of translation in the Google Translate app. Figure 4. A screenshot of an image translation from the Google Translate app. This case study shows how easy it is to use Google Translate to find your way around the world. However, it could also make it too easy. One of many reasons for travelling is the wish to discover new countries and cultures or to learn a new language. By translating everything with Google Translate new cultures might get lost in translation. Google Translate definitely makes life easier for the average tourist but a certain aspect of travelling gets lost. The level of tourism has grown and this requires a new tool to make translation easier. This means that Google Translate is a consequence of globalization. Google Translate’s role as a contributor to and a consequence of globalization has shown that Google Translate is definitely on its way to achieving its goal of breaking language barriers and making the world more accessible. It is a contributor because languaging has achieved a higher level of complexity and becaues it enables networking in our current network society. Google Translate is a consequence because a tool was required to make translating easier in our globalised world. Language barriers have become weaker but they are definitely still present. Solving this problem completely would require Google Translate to make perfect translations and to take context into consideration. For now Google Translate can function as an acceptable alternative for recreational use such as travelling. However, Google Translate cannot be used in professional situations since it is not possible to implement safety measures for confidential materials and the program is not sophisticated enough to make distinctions between different contexts. Blommaert, J. (2013). Ethnography, superdiversity and linguistic landscapes : Chronicles of complexity(Critical language and literacy studies, 18). Bristol: Multilingual Matters. Brownlee, J. (2017). A Gentle Introduction to Neural Machine Translation. Castells, M., Communication technology and society,. (2004). The network society : A cross-cultural perspective. Cheltenham: Edward Elgar. Castells, M. (2010). The rise of the network society(2nd ed., with a new pref ed., The information age : economy, society, and culture, v. 1) [2nd ed., with a new pref.]. Chichester, West Sussex: Wiley-Blackwell. (2010). Dickinson, G. (2018). Is Google Translate improving or ruining the way we travel? Jacobs, H. (2018). I travelled the world for 6 months, and here’s the single best app I couldn’t live without. Martin, A. (2018). Google Translate will never outsmart the human mind - and here’s why. Schild, J. (2017). Why Google Translate is Bad for Business. Turovsky, B. (2016). Found in Translation: More accurate, fluent sentences in Google Translate. Turovsky, B. (2016). Ten Years of Google Translate. Online Culture student and book enthusiast.